1/2 Grip Range, Emka T-Handle Pawl Latches, w/o Padlocks, Black, Heavy Duty NEMA 4 Rated 1/4 Turn Latches (1 Each) by EMKA at RRH Place. MPN: ELH-97. Hurry! Limited time offer. Offer valid only while supplies last. 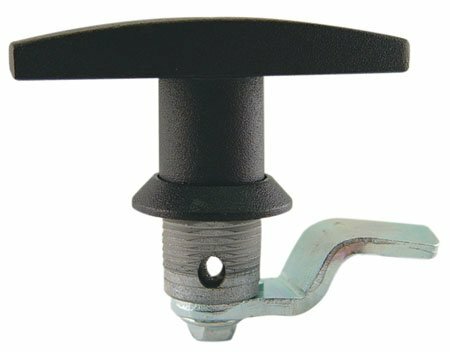 Heavy Duty NEMA 4 Rated - 1/4 Turn Latches - T-Handle Pawl Latches with or without Locks - Available in zinc die cast with chrome or black finish. Heavy Duty NEMA 4 Rated - 1/4 Turn Latches - T-Handle Pawl Latches with or without Locks - Available in zinc die cast with chrome or black finish. Available with or without keyed locks. All locks are keyed alike. Keys included. View More In Compression Latches. If you have any questions about this product by EMKA, contact us by completing and submitting the form below. If you are looking for a specif part number, please include it with your message. Echo / Shindaiwa 17730504920 PAWL ASSY.